It’s not uncommon to find a garden with a few tulips planted here and there. It is a little odd to find them shining brightly though. Although a normal tulip does need sunlight, this particular type runs purely off of the sun. This doesn’t take any pesky tending or watering. Instead just sit it out in the sun and it will shine brightly as soon as the sun goes down. The thing that concerns me is that you choose a pattern for the bulbs to flash continuously in. Hopefully they allow for them to be flipped to a mode where they don’t flash at all, but just shine. Otherwise I’d end up wanting to accidentally run this over with the lawn mower. It has an auto-sensor so that it can automatically turn on when the sun is down. 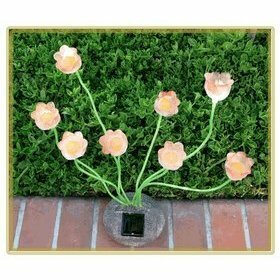 You can purchase these LED tulips from Amazon for $26.99. Although I doubt that it’d be enough to replace real tulips out in your garden.